Are treatments only for natural gems? Treatment or enhancement, as we all know, is widely applied on almost all, especially lower quality gem materials to improve their appearance (colour and clarity) and / or durability, thereby increasing their salability. Also, some of the methods of treatments performed on cheap, inexpensive materials are known for imitating well-known gem materials, such as dyeing of quartzite to imitate rubies, sapphires, emeralds, etc. However, the methods of treatments are now not only restricted to the lower quality natural materials, but also some finer qualities of synthetic counterparts too. In the last decade, we have witnessed quite a few synthetic materials being treated with commonly used methods, which are now commercially available with deep penetration into the market. The most common material is the flame-fusion synthetic corundum (red, blue, yellow, colourless) which is heated (including quench crackling), flux-induced, glass-filled or diffused and presented as natural; these are often mixed in parcels of natural corundum, whose separation becomes a real challenge (figure 1), especially for a jeweller or gem dealer. very challenging if serious observations are not made. These treated synthetic sapphires can easily be mixed in parcels of natural sapphires. Few other gem materials include diamond, quartz, moissanite, cubic zirconia and even corundum, which are treated (annealed and/or irradiated), not for deception but to produce the desired colour / variety, such as star ruby and sapphire. Heating natural corundum (ruby / sapphire) is known for decades to modify colour and / or clarity and is usually the improvement of both these Cs. However, in case of synthetics, heating is usually done not to improve the clarity but to decrease, although, in some cases, synthetic corundum (flame-fusion) boules or flux-grown crystals are heated to improvise the colour. Because of its wide usage, synthetic corundum grown by flame-fusion process is mainly discussed; while those grown by flux or hydrothermal process are seen only occasionally, hence do not demand a discussion here. Heating of synthetic corundum boules not only improves the colour but also clarity by removing the gas bubbles. 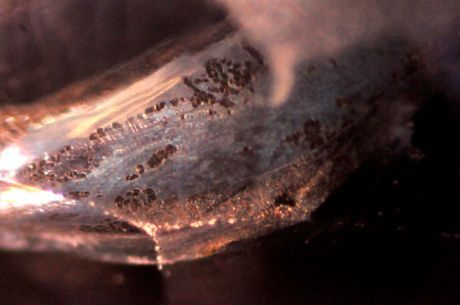 However, in the process, curved growth features also get diffused and their visibility reduces considerably, and in some cases become almost invisible making the identification challenging even for gem labs. These curved growth features are a result of temperature variations and concentration of impurities along successive growth layers. On heating, the junctions of these layers are dissolved and due to very low temperature gradient during re-crystallization the growth features become almost invisible and the colour evenly distributes; heating also reduces the visibility of 'plato-lines'. Such heating is usually carried out as a part of synthesis process to produce material of desired clarity. "a synthetic stone cannot have (eye-visible) inclusions !" It is a general perception of few gem dealers or jewellers that if a given ruby or sapphire is a synthetic, it will be clean; a synthetic stone cannot have (eye-visible) inclusions. Individuals with such a perception have often found to be deceived. We have seen many such cases, when a flame-fusion synthetic ruby or sapphire containing (eye-visible) clouds of gas bubbles is generally mistaken for clouds of silk (figure 2), that too of a Burmese stone! Figure 2: The clouds of tiny gas-bubbles in these synthetic flame-fusion corundums (ruby & sapphire) can be mistaken as 'clouds of silk'. However, to an extent this is true for flame-fusion stones that they usually do not have eye-visible inclusions other than clouds of gas bubbles or sometimes clouds of titanium oxide particles, while majority of synthetic corundum is transparent clean pieces, which can be separated from the natural stones quite easily. But, the treaters are smart enough and have produced inclusions in the 'clean' pieces of synthetic corundum. Stones are heated at around 1000 to 1200 degrees Celsius for 3 to 4 hours and dropped into cold water; sudden change in the temperature crackles the stone. These cracks give appearance of fingerprints to an untrained eye (figure 3). The process is being applied on synthetic corundum as well as quartz for many decades, which displays a typical 'checker-board' effect, providing a straightforward identification clue, especially for trained eyes. The 'quench-crackled' stones are often reheated at around 1200 to 1400 degrees Celsius for 72 hours in a colourless flux (such as borax) where the flux melts and enters into the open fractures, thereby healing them. In place of reflecting fractures, such treated stone will display a fingerprint pattern, giving a 'checker-board' effect (figure 4). The principle as well as the resultant appearance of fractures is similar to that observed in flux-healed fractures / fissures of natural corundum (figure 5). Figure 4: Induced fingerprints in synthetic flame-fusion corundum typically display a checker-board pattern, assisting in their identification. Figure 5: Details of a flux-induced fingerprint in a synthetic flame-fusion sapphire. Such features are also seen in flux-healed fractures of natural corundum; hence, separation of natural and synthetic counterparts cannot be done on the basis of such features alone. In addition to the fractures healed with flux, few synthetic rubies have been encountered in recent times which were filled with lead-glass. 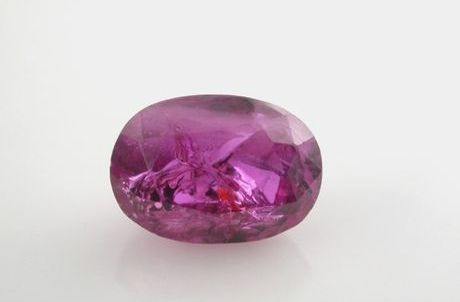 In such cases, the more obvious features are displayed by the lead-glass (such as flash effect or trapped gas bubbles) and not by the stone itself, therefore, if not carefully analyzed these rubies can easily be misidentified as natural - glass filled. In the last 5-6 years the author has observed numerous specimens of synthetic corundum which were heated with flux but did not display the characteristic 'checker-board' effect. These specimens had random individual or group of fractures, giving appearance of a healed fracture or a heated fingerprint (figure 6), similar to those seen in natural (heated) corundum. Some of these are quite shallow and fine. The author believes that such individual fractures are difficult to produce by the 'quench-crackling' process and are stress-related fractures produced at the time of production of the synthetic crystal (boule). On heating, the flux enters into such fractures thereby healing them which give appearance of a healed (heated) fingerprint. In such cases, identification and separation of natural and synthetic stones becomes a real challenge (figure 7), unless features typically associated with synthetic or natural stones are observed carefully. 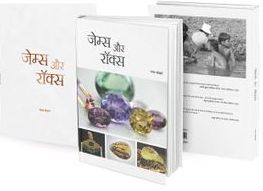 We have seen many careless observers or jewellers / gemmologists misidentifying such synthetic stones as natural. Figure 6: Natural or synthetic? In recent times there have been many encounters of synthetic corundum whose fractures did not display a typical checker-board pattern, but large random fractures, similar to those seen in natural corundum . 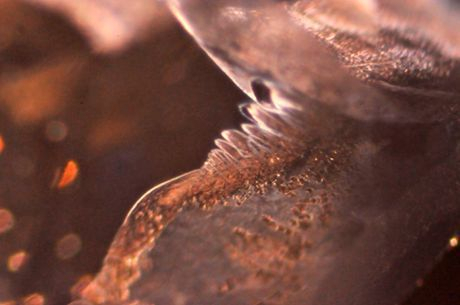 Both these images are of healed fractures in a synthetic sapphire. Figure 7: Natural or synthetic? Small surface breaking fissures or stress cracks are often healed with flux during the heating process, which give appearance of fine tiny fingerprints. The image on the left shows flux-healed fissures in a natural heated sapphire while that on the right in a synthetic sapphire. Observation of such features alone cannot give any clue regarding stone's natural or synthetic origin and hence a synthetic stone may be misidentified as natural. 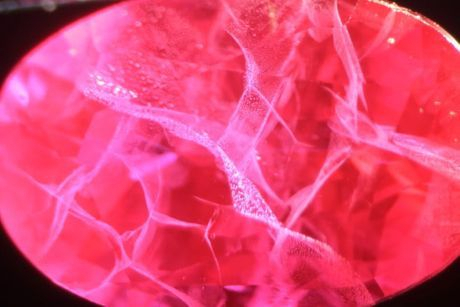 Then, the author has also seen few synthetic rubies whose fractures were filled with some orangy red compound (figure 8) giving effect of 'iron-stained' films, which are a common feature for natural stones. However, presence of such films may mislead the jeweller / observer unless other inclusion features are not analyzed carefully. hence.....a synthetic stone can have eye-visible inclusions! 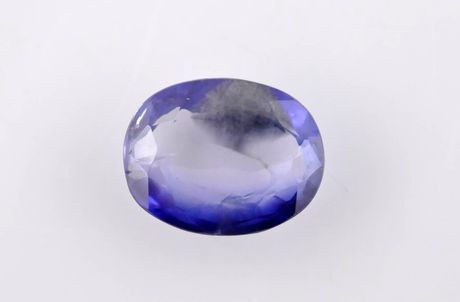 There have been numerous examples, when an observer has made mistakes while separating natural and synthetic corundum, especially when they are treated. This is mainly because the features such as healed fractures or iron-stained films are more obvious, and are associated with natural counterparts. However, this is to be kept in mind that these surface related features, most of the time, can indicate only the presence or absence of treatments, and not whether the stone under test is natural or synthetic; separation of these two should always rely on study of internal features. All photographs and photomicrographs by G. Choudhary, unless otherwise stated.